Synopsis (from the publisher): Bill, the "Nameless Detective," and his wife Kerry were in the Sierra foothills, just outside of Six Pines, falling in love with a cabin. It was all perfect, until Kerry went missing. They'd seen Balfour at breakfast at the diner and Kerry remembered his name … PR people are like that. Which was unfortunate, because when she ran into him along the trail on that sunny afternoon and called him by name, he panicked. And that's when Bill's nightmare began. In a small town with limited resources, where a major case was keeping everyone busy, a private investigator demanding action wasn't very popular. They were doing all they could, Bill was told. But it wasn't enough. With the help of his longtime associate Jake Runyon, Bill begins a search that uncovers just what price the citizens in a town without pity might have to pay. 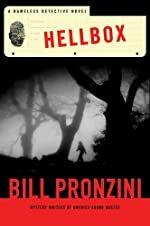 Bill and Jake follow the few leads they have, and come face to face with the Hellbox.